If you have food and the water supply is interrupted, you will need a sawdust or composting toilet. You do not want to be burdened by a walk to the well or to the nearest creek or pond to get water for flushing a conventional toilet when water is no longer pumped into your home. Add a black plastic trash can liner. Cover deposits with peat moss. Remove trash bag and put it next to the garden in direct sunlight. Poke a few holes in the bag and let it compost. Build your own (genration 1). Humanure Handbook. Free. Available in 7 languages. The “$25 (or less) Hinged-Top Humanure Toilet” used all over the world. 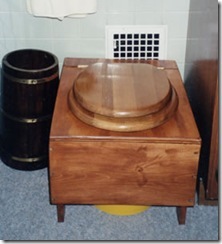 This system has three necessary components: the sawdust toilet, cover material (peat moss, sawdust, etc.) and the compost bins. Two compost bins are needed because composted waste must sit for at least one year without fresh manure being added before it is safe to use on your garden. If the compost pile is too small to get hot then wait two years. The entire award winning Humanure Handbook is available as free download online. Hard copies can also be purchased in several languages. No one should be without an inexpensive simple composting Sawdust toilet during periods when water is scarce or inconvenient to haul. Use sawdust for cover material, not wood chips. Sawdust and peat moss are most effective for minimum odor. Sawmill sawdust is more effective for odor prevention than kiln-dried sawdust. One user of a sawdust toilet reported that he had found a way to bypass the need to construct and maintain the composting bin recommended by Jenkins. Instead, black trash bags intended for use in a trash compactor (much tougher than garbage bags) were used as a bucket liner. When full, the black bags were removed and put in a sunny spot next to the garden. After an unspecified length of time the contents were completely decomposed and the finished product was without odor. Once the compost had cooked the trash compactor bags could be emptied in the garden and recycled as a fresh liner in the collection container. Many styles of composting toilets are available from SunMar. Two of us used the Excell NE ($1495, Apr 2009) full time for several months with great success. There was very little odor and no overflow. If odor or overflow become a problem, use more peat moss. Cover all deposits with peat moss (works best), sawdust or other material. Sawdust is a much better choice than wood chips when choosing cover material to minimize odor. Article and videos about composting toilets from Off-Grid. Sun-Mar Composting Toilets Many models to choose from. The self contained Excel NE (non-electric) sells for $1495. The Sun-Mar Excel (model with electric heater) toilet I have was modifed to use a 4 inch diameter stack instead of the smaller stack used with the electric version. The modification was made to unburden the solar electric system. Sometimes there is beauty and art in simplicity. Cover deposits with peat moss or sawdust.